A native of Mexico, Raquel worked for years cleaning offices. She got one step closer to her passion when she started cleaning a dance studio in Redwood City. One of the perks of the job was free Zumba classes. The studio's director noticed Raquel's talent and suggested she become a certified Zumba instructor. Raquel did that, and soon, she was teaching her own Zumba classes. Raquel says she decided to lead the fundraiser so that more students could benefit from Upward Scholars support. "No one offers help to people like us, to push us to study," Raquel says. "I saw the receipts for my books. And I can't imagine how I could pay for them without this help. With this fundraiser, I hope Upward Scholars can help more students." 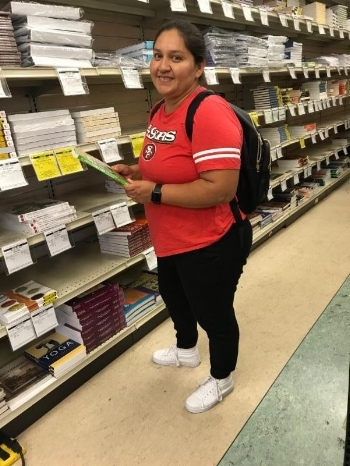 This semester Raquel is working full-time, teaching four Zumba classes and, with the assistance of Upward Scholars, taking two ESL classes as well as a ballet class. Once she completes all of her ESL classes, she'll begin her major in kinesiology with a focus on dance. Her goal is to open her own dancestudio. When: Saturday, October 13 at 2 p.m.
RSVP here by October 10th.